Relax with our Tuscany Resort Stay, enjoying Italy’s premier spa town. Montecatini is the perfect place for a relaxing holiday in the heart of Tuscany. Soak your cares away in the waters of its thermal springs, while away the hours wandering around the ancient upper town and modern spa resort below, make the most of the many facilities at your chosen hotel, or join us on optional excursions to Portofino, Pisa, Florence and Volterra. Montecatini’s fortified upper town endured siege and destruction through the centuries until the 20th century brought prosperity and the development of the lower town, but today the emphasis is firmly on relaxation and enjoyment. As well as the famous spa baths, the lower town boasts beautiful parks and gardens, stylish shops, cafes and restaurants. There are tennis courts, bicycle hire and a golf course to occupy the energetic, and a trip to the upper town (Montecatini Alto) will be rewarded with a pretty Romanesque church, ruined medieval fortifications and a choice of excellent restaurants. Those wishing to explore will have the chance to join a range of optional excursions (listed below), which will be offered on specific days during your stay. Simply select your chosen excursion(s) from the list when booking. Spend the day exploring the beautiful Ligurian coast. Here some of Italy’s most famous resorts nestle on a shoreline backed by wooded hills. See the gardens and piazzas of Santa Margherita Ligure, which overlooks a stunning bay at the northern end of the Portofino headland, then take a boat trip along the coast to discover Portofino itself. Despite its exclusive, chic reputation, Portofino remains one of the Mediterranean’s most delightful locations. See the Italian gems of Pisa and Lucca on this guided tour. Pisa’s treasures include the famous Leaning Tower, the circular Baptistery of St John (which took more than 200 years to complete) and the mighty Duomo, while the elegant walled city of Lucca’s medieval clock tower, the Torre delle Ore, and the oval expanse of the Piazza dell’Anfiteatro (which stands on the site of the ancient city’s Roman amphitheatre) are just some of of the highlights you’ll discover there. Revel in the wonders of Florence, Italy’s beautiful Renaissance capital. On this city tour you’ll see the magnificent Florentine skyline, explore Santa Croce and cross the medieval Ponte Vecchio. For art lovers, the Accademia houses Michelangelo’s peerless statue of David, and the Uffizi, Botticelli’s exquisite ‘Birth of Venus’ (gallery entry is payable locally). 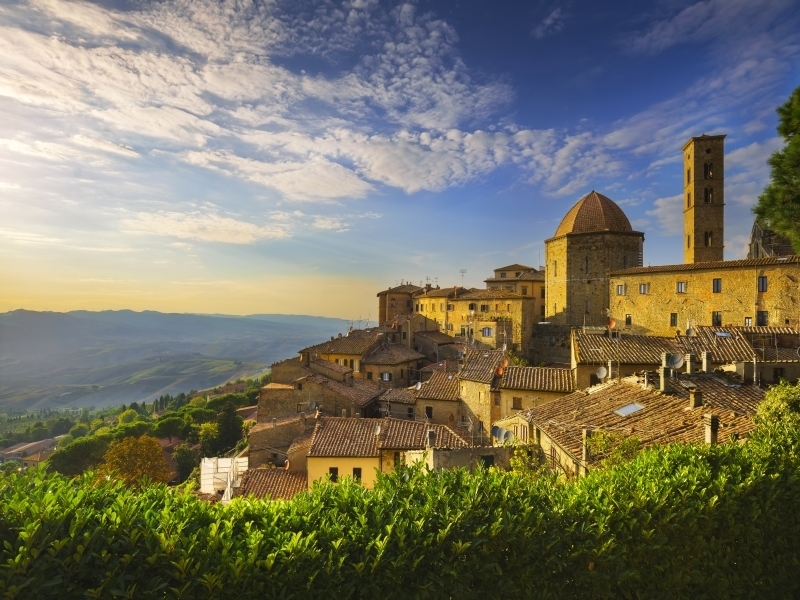 Head into the Tuscan countryside to explore the exquisite hill towns of Volterra, Certaldo and UNESCO-listed medieval gem San Gimignano. Set high above the Cecina and Dell’Era valleys, Estruscan Volterra is beautifully preserved, with its ancient walls surrounding a medieval core, at the heart of which is a stunning Romanesque cathedral and the ornate Piazza del Priori, lined with beautiful palazzi. You’ll also take in the Roman amphitheatre, uncovered in 1951. No less fascinating is the charming ‘twin-town’ of Certaldo, the ‘newer’ lower town nestled beneath the upper, fortified Certaldo alto, with its ancient gates and defensive walls. Saving the best until last, the day concludes with a visit to San Gimignano, where fairy-tale towers rise from the hill-top villages.